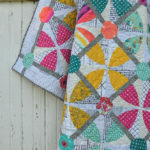 It’s my turn to show off the pretty new fabric by my friend, Mathew –Mister Domestic– on the Loved to Pieces blog party! This is the first collection that Mathew has designed for Art Gallery Fabrics and it’s inspired by love for his daughter and his affinity for all things sewing, especially English paper piecing. When you look at the prints, you’ll notice flowers constructed of geometric shapes and plenty of good opportunities for fussy cutting. Of course, Mathew is one of the most fun people I’ve met in the quilting world, so I couldn’t resist accepting his invitation to join his celebration of becoming a fabric designer. It also helped that Loved to Pieces pretty much includes all my favorite colors! One pattern I keep coming back to is the Eclipse quilt. I have made several versions of it already, and it is the perfect pattern when you really want to show off pretty fabric as well as an interesting piecing design. The cutting of the curved pieces is all done with the Classic Curves Ruler, so it’s fast, easy and accurate. 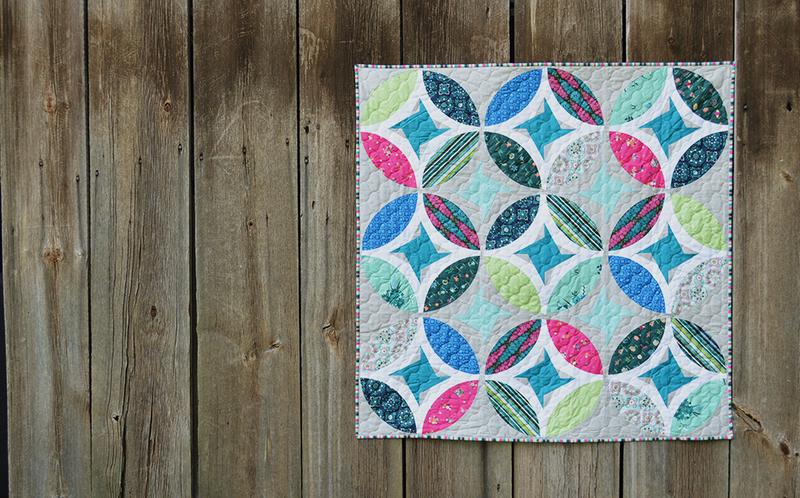 I happen to really love the orange peel shape, so this quilt will probably remain a favorite. Making Eclipse in the Loved to Pieces fabrics was a lot of fun because it’s different from anything I’ve made lately, color-wise. I am really impressed that Mathew created such a useable fabric collection: the prints have a good scale and variety for piecing and the palette is coordinated but has enough variation that it doesn’t need anything added if you don’t want to. Be sure and follow along with Mathew and all the talented makers featured this week and next. 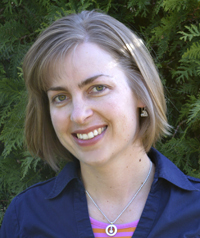 Find the full schedule and links to projects, Here. Also follow along on Instagram and Facebook for weekly giveaways during the tour. 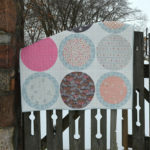 You can buy Loved to Pieces fabrics now at your favorite quilt and sewing shop. The Eclipse pattern and Classic Curves Ruler are available, Here. 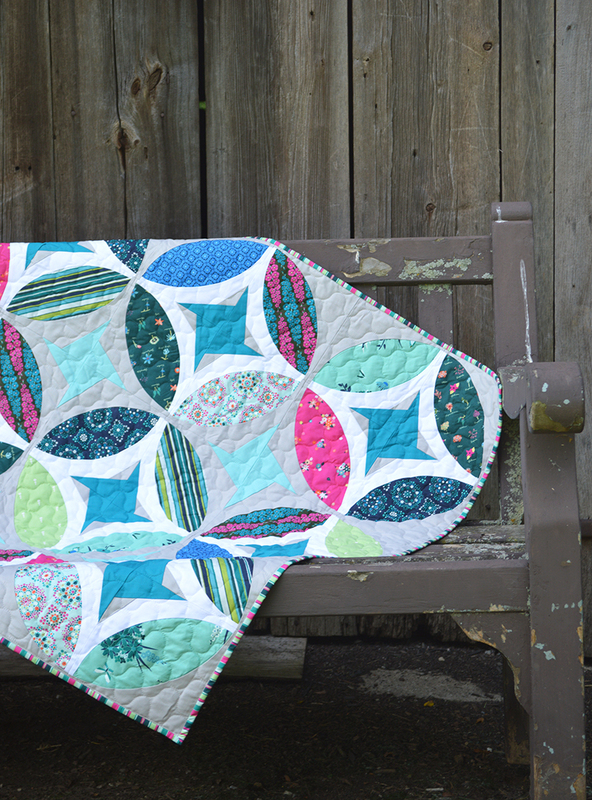 Be a Colorful Quilter! email subscribers get free patterns, tutorials, shop updates and more. Sign up for email today. Color Girl shop orders are shipped the same or next business day via USPS. Any personal information collected during a visit to this website or when making a purchase is not shared or used in any way other than to fill orders. Signing up for the e-mail list implies consent to receive periodic messages from Color Girl Quilts via email. Unsubscribe at any time. Personal and contact information is confidential. 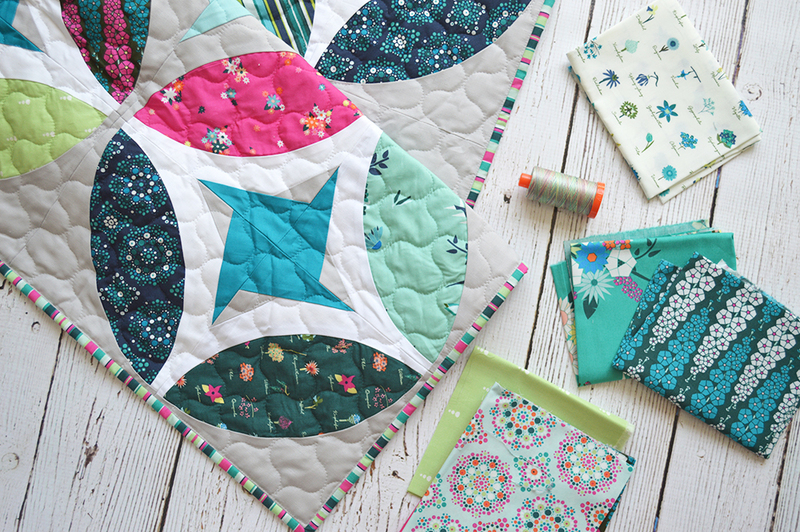 Beautiful quilt and I am loving Mathew’s new fabric collection!! Sharon, wow you nailed it with this collection ! I’ve never tried classic curves ruler or EPP. Thank you for all the tips , fussy cutting, etc. Maybe one day! The quilting is really appropriate too. 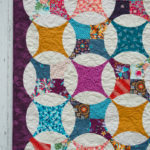 Do I spy more AGF on the back…Jeni Baker Geometrics? Beautiful! Goodness, typo. I meant loved “to” pieces.